Kazuma and his father walk back out of their house and back onto the backyard. "Now, my son, it is time for you to learn the Leaf Gale. While very simple, it is one of the most effective taijutsu maneuvers there is. Why I was known as Sosuke of the Leaf Gale back in my day." Kazuma shakes his head, "Oh really now? 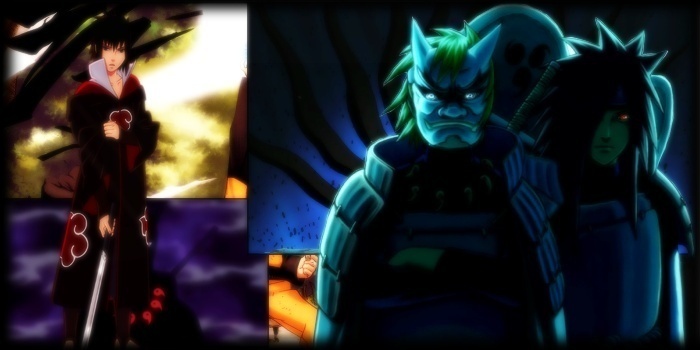 Well I'm gonna be Kazuma the Leaf Typhoon or Kazuma, Grandmaster of Taijutsu." Kazuma smiles as his father quickly drops then excutes a spinning rear low kick, sending Kazuma crashing to the ground. His father stands upright, "You shouldn't get so cocky. Or let your guard down." Kazuma slowly gets up as he holds his head. "Now I want you to try it on me. Give me all you got." Kazuma drops down and executes a spinning rear low kick but his father jumps up. "You have to do better than that!" Kazuma jumps up and seems to go for a high kick. His father drops down as Kazuma launches a low kick but his father blocks it. "Tsk tsk tsk. What is wrong with you?" Kazuma smiles as he quickly drops down and executes another Leaf Gale as his father does a backflip to dodge the attack. His father's legs kick Kazuma's chin before he land upright. Kazuma falls down then stands back up. Kazuma points behind his father. "Look! It's a beautiful and curvacious woman!" His father laughs, "How dumb do you think I am?" Kazuma smiles as a young woman walks past his father. His father's jaw drops as he stares at the woman. Kazuma takes advantage of his father's distraction and runs towards him. He stops a foot away from his father, drops down and executes a third Leaf Gale. Kazuma starts laughing and says, "Never let your guard down dad." His father looks up at him and laughs. "Good job." RR: RR 20, number is the chance reduction for enemy evasion by %. Dmg = str X 2. Post in Character updates to add this jutsu to your list.